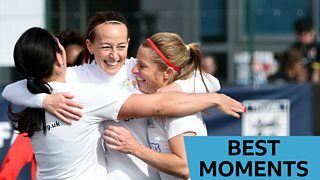 From inventive lawnmower celebrations to a back-flick and finish that would have made Lionel Messi proud, the semi-finals of the FA People's Cup - the nation's biggest and most inclusive five-a-side tournament - had it all. The competition began in February with 4,500 teams in 15 different categories, and now there are 98 teams heading to the finals weekend in April - taking place at St George's Park. Catch up with all of Saturday's & Sunday's semi-final action - and watch highlights from the semis on the BBC iPlayer.